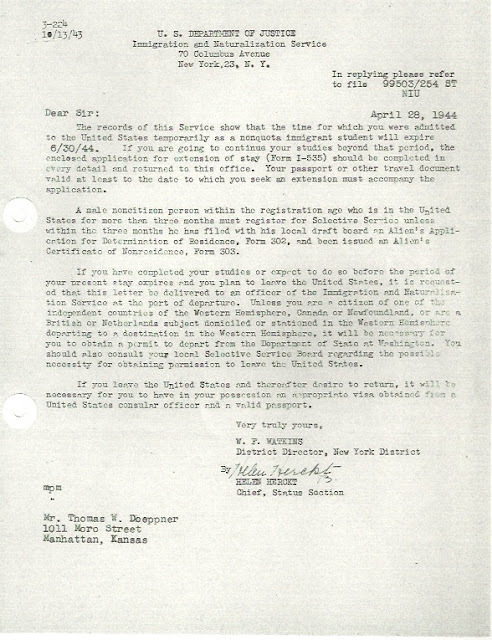 The records of this Service show that the time for which you were admitted to the United States temporarily as a non quota immigrant student will expire 6/30/44. If you are going to continue your studies beyond that period, the enclosed application for extension of stay (Form I-535) should be completed in every detail and returned to this office. Your passport or other travel document valid at least to the date to which you seek an extension must accompany the application. 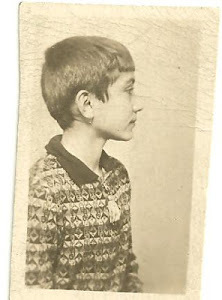 A male noncitizen person within the registration age who is in the United States for more than three months must register for Selective Service unless within three months he has filed with his local draft board an Alien's Application for Determination of Residence, Form 302, and be issued an Alien's Certificate of Nonresidence, Form 303. If you have completed your studies or expect to do so before the period of your present stay expires and you plan to leave the United States, it is requested that this letter be delivered to an officer of the Immigration and Naturalization Service at the port of departure. 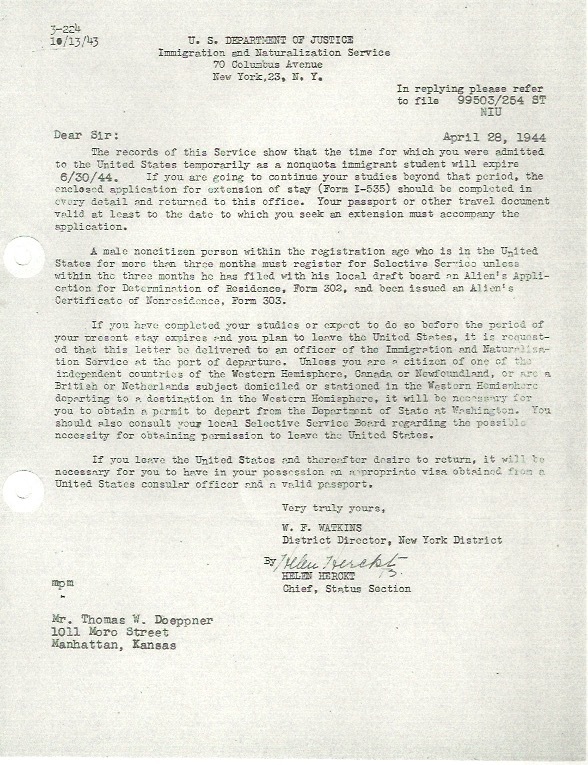 Unless you are a citizen of one of the independent countries of the Western Hemisphere, Canada or Newfoundland, or are a British or Netherlands subject domiciled or stationed in the Western Hemisphere departing to a destination in the Western Hemisphere, it will be necessary for you to obtain a permit to depart from the Department of State at Washington. You should also consult your local Selective Service Board regarding the possible necessity for obtaining permission to leave the United States. If you leave the United States and thereafter desire to return, it will be necessary for you to have in your possession an appropriate visa obtained from a United States consular officer and a valid passport. 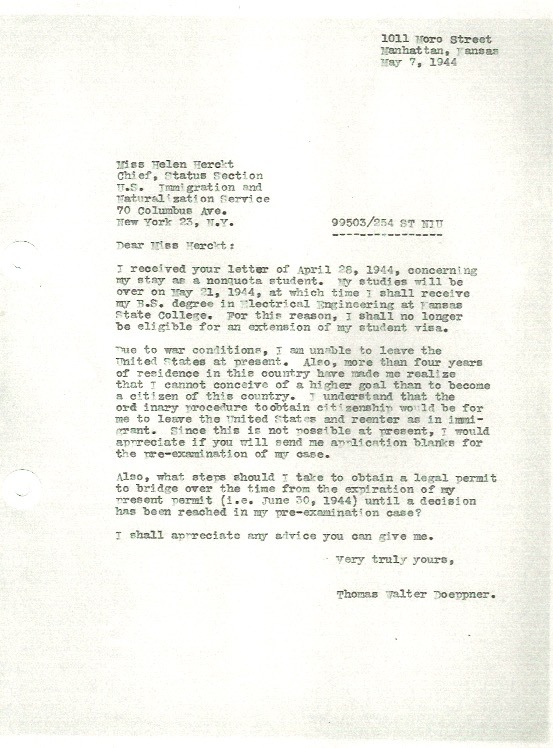 I received your letter of April 28, 1944, concerning my stay as a non quota student. My studies will be over on May 21, 1944, at which time I shall receive my B.S. degree in Electrical Engineering at Kansas State College. For this reason, I shall no longer be eligible for an extension of my student visa. Due to war conditions, I am unable to leave the United States at present. Also, more than four years of residence in this country have made me realize that I cannot conceive of a higher goal than to become a citizen of this country. I understand that the ordinary procedure to obtain citizenship would be for me to leave the United States and reenter as an immigrant. Since this is not possible at present, would appreciate if you will send me application blanks for the pre-examination of my case. Also, what steps should I take to obtain a legal permit to bridge over the time from the expiration of my present permit (i.e. June 30, 1944) until a decision has been reached in my pre-examination case? I shall appreciate any advice you can give me. I'm always surprised at the short notice that Opa is given when his visa is about to expire. Luckily he has had a fairly quiet time with the INS for a while. I don't know if June 30, 1944 was looming in Opa's mind as a date upon which he had to do something, or if he was a little taken aback to get this letter and deadline. My heart kinda skipped a beat when I saw the word "expire." This letter from the INS was very confusing. I have no idea how people navigated this paperwork (then and now) without fluency in English, multiple degrees, and experience in government work. From what I could gather, Opa has a handful of options. He can further his studies and extend his student visa. He can go home, if home is in the Western Hemisphere (really, northwestern). He can leave and then come back as a bona fide immigrant (with a quote from a US consulate in a foreign country). Then the options get more muddy. He also might need to sign up for conscription with the United States. This part confused me a bit. How is it that a non-citizen visiting for 3 months or more could be drafted into the US military? But that's what it looked like, in fact, it looks like all eligible men have to sign in. There was another option about a certificate of an Alien but I have no idea what that meant. I'm sure someone smarter than I am can decipher. Opa completely ignored that paragraph altogether. He wrote back to the INS and stated simply that with the war going on, there was no way he could leave America. He cleverly left out his country of origin, and the fact that he no longer had valid travel papers. His German passport was destroyed and his Holland Identification certificate long expired. Opa announced that he would graduate with a BS in Electrical Engineering and had no further education plans, so a student visa was not a viable option. He then declared his love for the United States and wrote that he wanted to become a citizen. Part of becoming a citizen is coming to the United States as an immigrant (not a visitor or on a special visa like the one he had). The only way Opa could come to the United States as an immigrant was to leave and then come back. Magic happens when you step over the border. All of a sudden, you are a new person when you come back with a different sheet of paper. The problem was he had no country to walk into, and no hope of getting that beautiful piece of paper that would allow him back in. The refugee crisis was temporarily at a standstill, as the war prevented pretty much all movement across borders, particularly enemy lines. I'm not sure if this would have maybe been an opportune time for Opa to apply for an immigration visa. The problem of "where are you from?" is still there, though. Part of the process of leaving the country and coming back as an immigrant interested in citizenship, was that you could get your case pre-examined. Kind of like a pre-approval, but less solid. Honestly, I think Opa was trying to buy time. He didn't know when the war would end, what his status would be after the war, and how the rules would change. He might have hoped to buy some time until he got a job, when he might be able to apply for some form of a work visa. In all of this, I can't help but wonder, where was Grandmother in this? Did she know that Opa's residency in America hung by a flimsy thread? Did Opa have a plan that he shared with her? Did they know how this was all going to work out? Did Grandmother ever for a minute think she might have to leave the United States to follow her German husband? 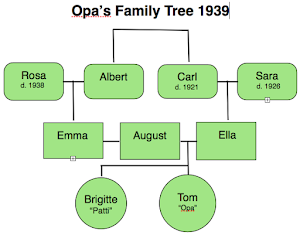 Or did Opa keep it all hush-hush until he had a plan? I have no idea. I know that this INS path is not predictable. I wonder how scared they were about it. I would love to hear feedback! Share your thoughts and your stories. GoFundMe To Write a Book! Hey guys- would you like to support my endeavors to put this story into a book? I'm working on it now and have some interviews and artifact collection I'd like to do- I just need a little help for airfare to get me there. I deeply appreciate ANY support you give! Click on this link to donate! I'm a mother of two boys and married to my favorite person. 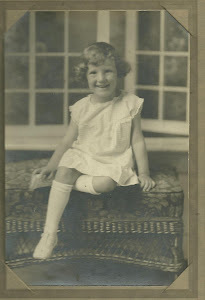 I am currently working full time on this blog and A Book About Love to share this amazing family story. I dream of changing this world one little dark corner at a time. All letters, pictures, documents and written materials found on this blog are the sole property of Sarah Snow. I am happy for you to share it, as long as you always give credit to me as the author/owner and link back to this website. Thank you! Do you have a specific question? Are you a researcher? 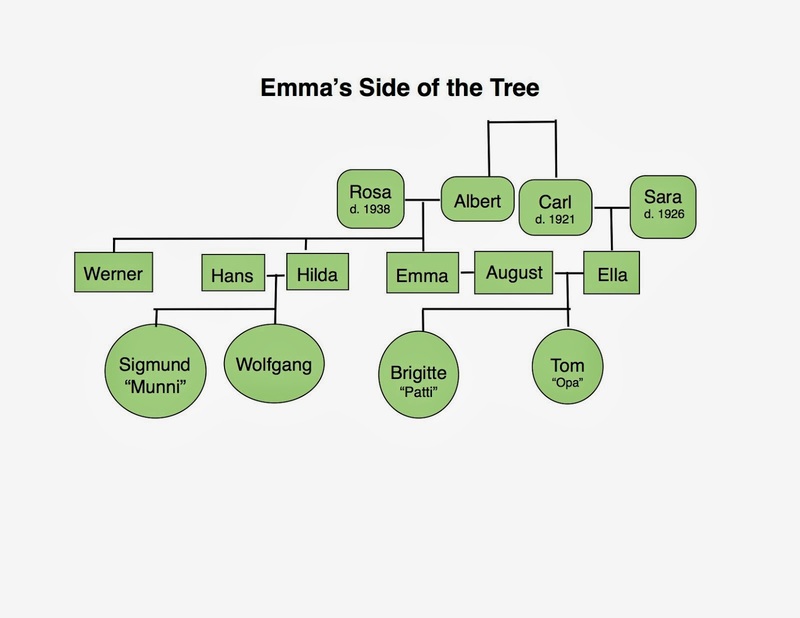 Do you have cool information to share with me because your Dad's uncle's second cousin knew my family? Please contact me at this email: marjorieandtom@gmail.com. This is for personal contact, not general comments on the blog- please leave those for all to see on the blog. Oh, and NO spam. Thanks! April 18-27, 1944: Happy Engage-Measles! Opa's note to me in his memoir.